The proposed redevelopment of a vacant office in northeast Tysons is moving forward for approval over the next month. 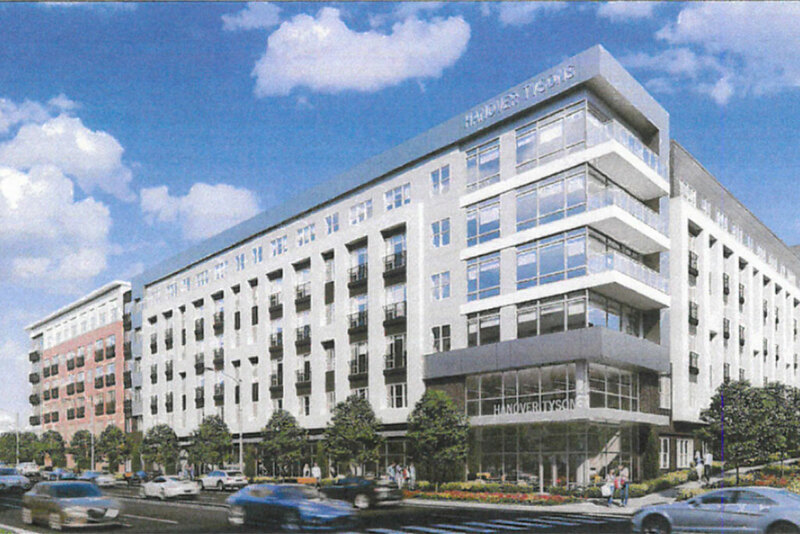 The Hanover Company’s plan is to demolish the existing seven-story office building and replace it with a new 400 unit residential development called Hanover Tysons. The project is scheduled to be discussed at the Planning Commission’s Feb. 27 meeting with a Board of Supervisors hearing at on March 19. The Washington Business Journal noted that the new development is one of the new crop of developments, like the nearby The Mile residential complex, that are being built slightly further away from transit than the more high-profile and high-impact developments like The Boro. Hanover Tysons is a little under one mile from the Tysons Corner Station, a roughly 20-minute walk. Brian Tucker, managing director for JLL, said at Bisnow’s Tysons State of the Market last month that developments are becoming increasingly stratified between those built almost on top of the Metro stations and those further away. According to the staff report on the new development, 66 residential units in the Hanover Tysons, or 20 percent of the total, will be workforce affordable.